Our chiropractic adjustments are very specific. We welcome you and your family to discover how to get well and stay well. Through a traditional approach to chiropractic care, we use Gonstead technique to deliver gentle, precise adjustments to your spine. While a healthy nervous system is the goal, we help realign your spine so your nervous system can function properly. We’ll teach you how chiropractic care helps your body heal on its own, from the inside out. Full Spine X-rays will allow us to correlate our previous findings to adjust only the segments of your spine where the nerve pressure is detected. At every visit we will use our Tempo-scope to check where you may be experiencing some nerve pressure. We check your entire spine each visit from “top to bottom.” This tool (or scope) measures temperature and tells us where you have inflammation caused by nerve pressure. This allows us to better determine where and when to adjust. Read more about our technique here. Regardless of your insurance coverage, payment will be due at each visit. We will gladly supply you with an insurance form or a receipt/statement that you can submit to your insurance company for reimbursement. If you have Medicare, you will pay as you go, we submit your claims, and if your care is covered, you will be reimbursed according to Medicare policy. We also work with Forward Health/BadgerCare .If you have questions about finances or insurance, feel free to give us a call. When you return, we’ll go over the report of findings. 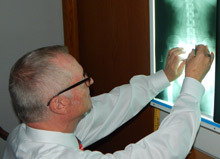 We’ll review your X-rays and explain what we discovered and how we are going to approach your particular needs along with our recommendations for you and your care here. We want you to fully understand everything and leave with your questions answered. We’ll then use our Tempo- scope to measure the heat differences along your spine. We then correlate our findings with your x-ray, and adjust you accordingly. Your spine works as a unit and we will always be looking for any changes as we continue your care. Our gentle adjustments are precise and effective in relieving your nerve pressure. You can expect your second and regular visits to last about 15 minutes. You’re in here for a reason, probably wanting to feel better or feel even better. The best way for us to help you is to stabilize your health through chiropractic care. “Preventive care is a lot easier than waiting for something to happen,” says Dr. Randal. We don’t, however, pressure anyone; we make our recommendations for care and let you make the decisions. We’ll re-evaluate your progress and tailor our recommendations to help you achieve the best results. We are excited about you experiencing the Gonstead difference.